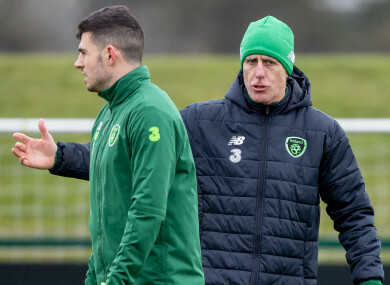 Mick McCarthy back on the training ground with Ireland. MICK MCCARTHY’S BACK to work, and you only needed to hear the gruff Barnsley voice stabbing through the Abbottstown air to know it. This morning he took his first Republic of Ireland training session in 17 years, and his centrality to it all was notable. Whereas Martin O’Neill often preferred to stand aloof and observe from a distance the sections of Irish training sessions open to the media, McCarthy was fully among the action: his shouting, instructing and cajoling audible at the edges of a roll call of players’ nicknames. “I loved it”, McCarthy told the media afterward. “I loved the atmosphere with the lads, the banter they are all having, the little boxes and the warm-ups; just being at close quarters with players. Not all of the players were present: Shane Duffy arrived late last night owing to his FA Cup involvement dragging past extra-time and into penalties while Conor Hourihane, Keiren Westwood and Richard Keogh join up with the squad tonight. Seamus Coleman and Seani Maguire sat out training, both out of routine. Coleman’s was general and Maguire’s bespoke: Everton played yesterday afternoon so Coleman was never expected to train, while Maguire’s training load is closely managed by Preston, given his injury profile. McCarthy expects both to train tomorrow and Wednesday. Coleman, meanwhile, will retain the captaincy “if he plays” against Gibraltar on Saturday. McCarthy also confirmed that the players will be aware of the team selection earlier on a matchday than was the custom of the previous manager, who usually unveiled his within 90 minutes of kick-off. Given this was McCarthy’s first day back to work, previews of the games ahead were intermingled with looks back to the past. McCarthy refused to look beyond the near-future (repeating that he is not taking Gibraltar for granted ahead of the Georgia game) and, inversely, preferred to address the distant past over anything that happened last year. Ireland’s wretched 2018, featuring as it did one win in nine games (a friendly game) and just four goals (all but one scored in friendly games), has not occupied McCarthy’s thoughts. “I’m looking forward, I’m not considering what went on before. Is there even mild fretting about the potential for some lingering negativity? I never even considered it. It’s only yourself [the media] who is mentioning the negativity, it’s got nothing to do with it. That’s got nothing to do with me what happened before. It’s up to me to get positive results and get people smiling again. “It’s my responsibility to change that. “We have to get the lads at it and play as well as we possibly can. It’s got to be about us. I’ll be doing my damndest, I’m sure the lads will. Turn the clock back a bit further. “The last time I was here was 17 years ago. So, some of them [the players] might remember me playing, I don’t know. The last time McCarthy completed at Euros qualification campaign with Ireland was for Euro 2000, when ambitions for automatic qualification perished with the infamous concession of a last-minute goal away to Macedonia. That night got a brave mention at today’s press conference. “I was going to be quite offensive to you then. Only [think about it] when people bring it up. “I was going to say something other than ‘people’ there. “We had the shirt with an ‘I’ve had a Macedonia’ on it, but since then I’ve had a few good results as well. It would be remiss of you to remind me of a night like that. “I’ve won the Championship twice and nobody ever mentions that, being in the PL. Had a pretty good time since. Oh, we qualified for the World Cup as well. The question of style came up as well, what with it being the topic that has stalked virtually every Irish press conference for the last ten years. McCarthy batted it back by saying that he’s “never been sacked for winning games”. “I reckon it’s my job to get results, however they might come. If we get enough good results and we have the Euro 2020 games here, that’s got to be my remit. If that coarse accent of his is subsumed beneath the Aviva’s cheers next week against Georgia, McCarthy can consider the first chapter of his Irish sequel a success. Email “'It’s up to me to get positive results and get people smiling again'”. Feedback on “'It’s up to me to get positive results and get people smiling again'”.